This resource has been sponsored by the Co-operative Education Trust Scotland and is designed for use in primary schools with a focus on additional support needs. Due to the great diversity of additional needs it would be impossible to create one resource to cover all, so the resource provides ideas to support children with communication needs in mainstream settings. It aims to reduce the emphasis on reading and writing print texts while enabling children to access, explore, develop their understanding of and respond to the topic through other means. The resource focuses on the skills required to make sense of texts and to author new texts that enable children to share newly gained information with a wider audience. Furthermore, activities are included to raise children’s awareness of the communication needs of others. Consider carefully how the children are grouped for the activities, think how best peers can offer each other support. For example, able, eloquent and assertive children may present a barrier to less confident group members. It is beneficial to promote and highlight good communication etiquette with all children. Introducing talking objects, timers and visual cues can help signal and establish the turn taking nature of discussions. Alternatively, video some group discussions and analyse these interactions with the children highlighting communication skills that enhance the process. 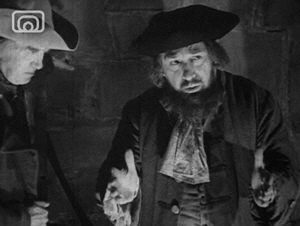 Film 1: Out of the Box (1942) Use the extract from 01:17 - 05:38. This is a short factual drama about the origins of the first co-operative movement set up in Fenwick in Ayr, Scotland (c1769) by a group of weavers. Evidence of the Fenwick Co-operative can be found at the National Library of Scotland. Before the class watch the film set up a visual timeline and map so that the children can see when and where this event happened in relation to the present day. The date of when the film was made can be added to the timeline and the term factual drama. Depending on the stage and needs of your class it might be useful to explain a little about the industrial revolution and war that resulted in the weavers setting up their co-operative, although this is not an essential requirement for the tasks. 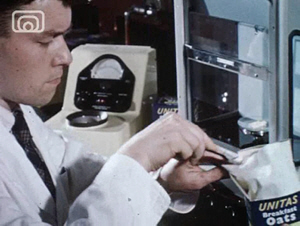 Preparation – Before using the film in class, listen/watch it and decide where best to pause the film to break it into appropriate ‘chunks’ for your class discussion. Familiarise yourself with words and phrases that you think need clarification. For example; wholesale, siller, ‘fallen on hard times’. Introduce the text by explaining that the dialogue is old fashioned and that there are a number of puzzling words and phrases in the text, consequently as a class we need to identify, discuss and research these words/phrases to help us understand the story. Divide the class into small groups and provide each group with writing materials or a Dictaphone. Assign one group member who is an able writer to be the recorder or use a Dictaphone in a turn-taking fashion with each member contributing their ideas. Once the entire soundtrack has been reviewed in this way pool the findings to create a class list of words and phrases to be investigated. In groups of equal size use discussion, the internet, dictionaries and other sources to find out what the words /phrases mean. Re-organise groups to contain one member from each of the previous groups to share their understanding of the words and phrases. You may wish to make this whole class a teacher led activity to ensure that all the children understand the terminology. Now watch the text with sound and visuals and discuss. Ask the children to consider how the characters present themselves to convey their emotions and views. Focus on body language, facial expression and how they speak. Pause the film at various points and ask groups of children to strike the pose of that still and take photographs of these poses. For example; when the carpenter gestures with the hammer and says ‘now look here’. Review the photographs asking the children to consider the characters emotions and actions. Why are they feeling that way? How does the viewer know this? How do other characters respond to the emotional signals sent by others? Ask the children to create and record voice overs for these photographs using language that would be understandable to an audience of school children today. Use the stills and voice overs to create a Power Point or other electronic presentation that tells the weavers story and the benefits of working co-operatively. As a class develop the stills and voiceovers into a play or a short film. Create an opportunity for the class to share their drama, presentation or film with other children. Ask your class to devise a method / task to measure how well they have succeeded in effectively telling the message of the Fenwick Weavers tale? Visit the Co-operative Education Trust Scotland website to find out more about the Co-operative Movement and the values that underpin them. As a class set up and run your own co-operative venture. Resources and examples of how other schools have done this can be found at the Co-operative Education Trust Scotland website and the Co-operative Website. After watching the film discuss how the Co-operative has grown since the time of the Fenwick Weavers. Provide the children with old magazines, papers and drawing materials and ask each group to create a collage of the Co-op products and services featured in ‘Tomorrow is Yours’ (Simplify the activity by producing a ready-made set of pictures featuring a variety of products and services and ask the groups to sort out those that were featured in the film). Ask the groups to visit the Co-operative Website to research the site to make a collage of the products and services provided by the co-op today. Compare the two collages to see if there are any differences in the product ranges offered in 1961 and currently. Discuss these differences. Why might they be so? Does the co-op today still manufacture their own brands in Scottish factories? If not, why might this have happened? 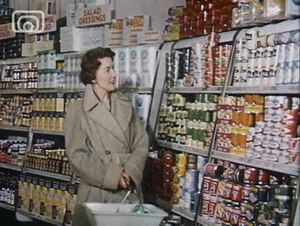 Compare the shopping experience at the start of the film with shopping today. Consider what has changed and why this has happened? For example the Co-op's use of Fairtrade and other ethical matters. See Co-operative Website - What You Can Do. Consider the impact of technology, particularly the social communications between customers and store assistants. 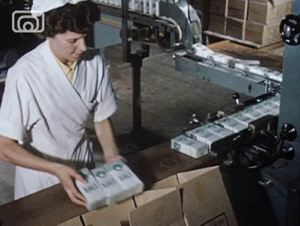 These clips show how food stuffs are processed and tested in the Scottish Co-operative Wholesale Society of 1959. After watching the film, can the children sequence the journey of salt arriving in the factory until it leaves for the shop? Draw storyboards or a diagram to represent this journey. 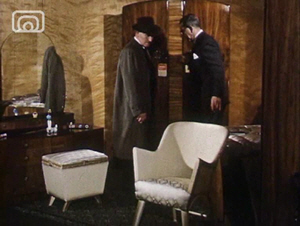 Simplify the activity by providing a set of stills from the film. These can be arranged manually or on the computer with an editing package or PowerPoint. Add written annotations or voice overs. Discuss what might happen if the journey gets muddled. E.g. what would happen if the salt did not get wrapped in greaseproof/waxed paper? Investigate greaseproof paper and a variety of other packaging materials to see which is best to keep foodstuff dry. Why / how do we package foods? Consider packaging on offer today. How is it different from 1959? Is it better? Less wasteful? Plan and go on a shopping trip to buy the ingredients to make porridge, jelly or custard. Read and examine the instructions on the packet. Using the instructions make these foods. How do the makers present the instructions (written/pictures/both)? How easy were they to follow? Discuss the implication of this for people that have additional needs. How would a person with limited vision or hearing cope? How could we ensure that a broad spectrum of cooks could use these? Ask the children to design instructions for one of the products so that all cooks can access the information. To make the activity more interesting remove the criteria that it must fit on the back of a packet, thus the children can explore the potential of interactive media. N.B. If you have children with specific additional needs in your class consider how best to sensitively approach this activity. It may be more suitable to discuss and design instructions for a need other than theirs to avoid highlighting them. There are a number of other Co-operative clips on Scotland on Screen with suggested activities relating to advertising, enterprise and other curricular areas. This lesson guide was developed by Primary School teacher Mairi Flood.